I bought some butternut squash and doubled, then modified this recipe: Creamy, Light Macaroni and Cheese from Cooking Light. Tim had no idea I was feeding him vegetables until after he’d eaten. 2 cups 2% Velveeta, cubed. Combine squash, broth, milk, and garlic in a medium saucepan; bring to a boil over medium-high heat. Reduce heat to medium, and simmer until squash is tender when pierced with a fork, about 25 minutes. Remove from heat. Place the hot squash mixture in a blender. Add salt, pepper, and Greek yogurt. Remove the center piece of blender lid (to allow steam to escape); secure blender lid on blender. Place a paper towel over opening in blender lid (to avoid splatters). Blend until smooth. Place blended squash mixture in a bowl; stir in cheeses. Stir until combined. Cook pasta according to package directions, omitting salt and fat; drain well. Add pasta to squash mixture, and stir until combined. Spread mixture evenly into glass or ceramic baking dish(es) coated with cooking spray. Bake at 375° for 25 minutes or until bubbly. Serve immediately. Top with grilled chicken (and/or bacon, tofu) if you want. 1% milk, greek yogurt tuna on wheat with spinach. bell peppers, cucumbers, hummus. Cheesy Penne with Broccoli and baked chicken breasts. Red wine. Lots. Tim and Misto convinced me that it would be okay to miss practice yesterday, even w/ a TT30 mix-up scrimmage. (Snow = bad roads.) Which was good because the scrimmage was cancelled. So I went shopping! 😀 I’ve decided that since overweight and old teachers wear leggings to work, I should too. (My legs look way better, it’s a disservice to the people if I don’t wear them…) I bought some online at Kohl’s, but they fit a little awkwardly, so I went to try the smaller size on. Ended up keeping the size I originally purchased (though ironically one of the packages says “M” but is actually “L” so I will have to return today to exchange them…), but picked up a pair of clearance real suede F-Uggs and some long sweaters for my new leggings look. (Rocking them today. Gray leggings, F-Uggs, lime green sweater! Pearls.) Then I went to Levi’s and (sorry Rebel) exchanged the black skinny jeans for a new pair and some gray ones. They look like khaki so I can also wear these to work, and those colors didn’t come in strait leg. And it was 2 for $80. Again. And they gave me a coupon. Again (bastards.) Who wants a Levi’s Coupon? Also–went to the Country Pedaler bike shop in Castle Rock and got some fancy cleats for my fancy new shoes. I’m so excited to try them out tonight! But I may hit practice instead… not sure. Misto-run practice w/ scrimmage after is promising… but spin… new shoes… we’ll see. My shopping prevented me from so much as walking the dog yesterday, but you know what? I don’t care! It was awesome. I had a great day. I made more of that delicious Cooking Light penne (with chicken this time) and hung out with Tim. Since he’ll be gone this weekend, that was an excellent use of time. Plus I didn’t have to sit in traffic and snow trying to get to the War*house or risk driving off the “cliff” by the Rec Center like the last time I went there in the snow. “Satisfecho,” incidentally, means “satisfied” en español, and is a phrase Tim used to use when we dated after we had a good meal and had that awesome feeling. I’m applying it to life right now. I’m content, I’m satisfecho. Oh–and I was in bed asleep before 10pm last night. Woke up feeling refreshed–first time that’s happened on a week day in a while. I did take a Tylenol PM last night… Push-ups/Sit-ups are soooo much easier on a morning like this morning than they are after a late practice when I get home late and don’t sleep all night… Gotta work on that. My first issue of Cooking Light arrived yesterday. I haven’t even read half yet, but I found a recipe that looked good and for which I had all the ingredients. So I made it for an early dinner/late lunch this afternoon. Pour into muffin pan, cook at 350 for 20-25 minutes, or until muffins stop bubbling and a toothpick inserted into the middle comes out clean. You can mix up the ingredients. Fresh tomatoes and kale instead of spinach and mushrooms. Turkey Sausage would be good– I didn’t see any that wasn’t pre-cooked, where should I look? And the quinoa can be cooked in milk instead, but that tends to make it “sticky” so it might not have blended in as well. I like the “cheese frosting” idea because then you can have cheese free or cheesy muffins, depending on your mood. 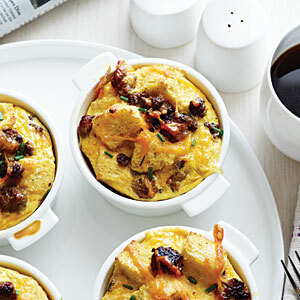 Healthy Sausage and Cheese Breakfast Casserole Recipes < Healthy Breakfast Recipes – Cooking Light. What do you ladies think? I think I remember Sunny doing some kind of egg casserole type think in muffin tins last TBT. 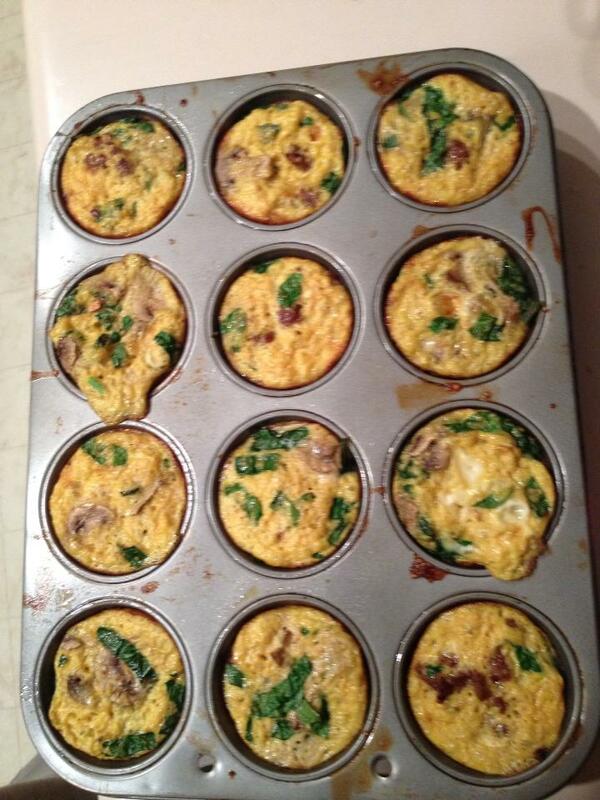 I’m thinking this recipe with all real eggs, no egg substitute… the sausage, almond milk? and… we could substitute quinoa for the bread pieces. Add some spinach? Maybe some mushrooms and bell peppers? Yeah? 1. Heat a large nonstick skillet over medium-high heat. Coat pan with cooking spray. Add sausage to pan; cook 5 minutes or until browned, stirring and breaking sausage to crumble. Remove from heat; cool. 2. Combine milk and next 6 ingredients (through eggs) in a large bowl, stirring with a whisk. 3. Trim crusts from bread. Cut bread into 1-inch cubes. Add bread cubes, sausage, and cheddar cheese to milk mixture, stirring to combine. Pour bread mixture into a 13 x 9–inch baking or 3-quart casserole dish coated with cooking spray, spreading egg mixture evenly in baking dish. Cover and refrigerate 8 hours or overnight. 4. Preheat oven to 350°. 5. Remove casserole from refrigerator; let stand 30 minutes. Sprinkle casserole evenly with paprika. Bake at 350° for 45 minutes or until set and lightly browned. Let stand 10 minutes. Made this for dinner last night before the party–it was delicious! Spicy, flavorful, but not overpowering. Sooo good. I follow Cooking Light on Facebook, and it popped up in my feed, looking delicious. Check out their facebook page for more great recipes. Do you ever annoy yourself? natural PB & simply j on wheat w/ 1% milk, greek yogurt w/ fruit and granola, a banana and an apple. Beer. Most of a bottle of wine. Yeah, no push ups or sit ups yesterday. Then I skipped Spin Class b/c Tim wanted me to have dinner and a movie with him. Probably a good thing since my legs feel like death. We cooked dinner together. We used to do that all the time. 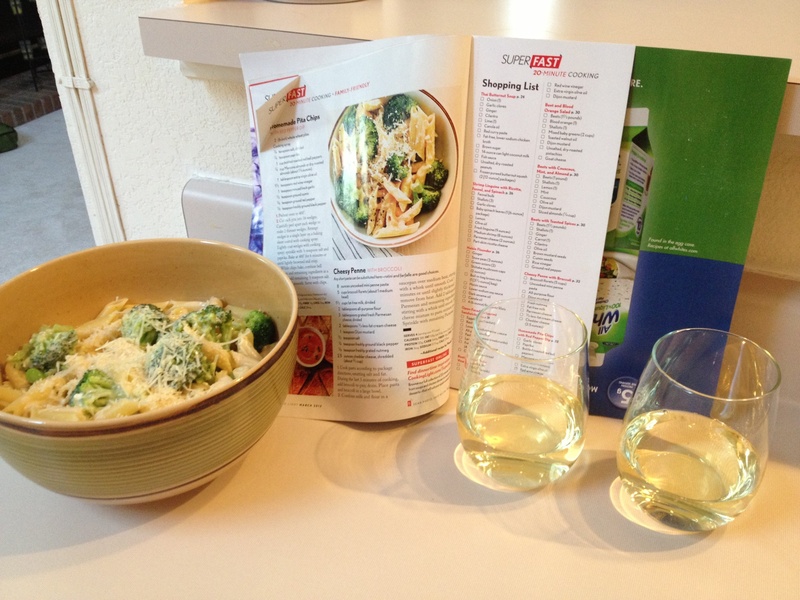 Tim even found a recipe on Cooking Light–except it ended up not being from Cooking Light… but it was good. He drives me nuts a bit, so I had to be extra patient. Here are the ingredients we were missing from the recipe: fresh mango (substituted canned pineapple,) curry powder (substituted cumin, turmeric, chili powder, and coriander), fresh ginger (substituted powdered,) coconut milk (substituted 1% milk & some coconut), red curry paste (substituted garlic chili stuff…), cauliflower (brussel sprouts,) green onions (omit). I’ll substitute a thing or two. Fresh for ground ginger, ok. But that was like half of the ingredients. It turned out good. I guess. I dunno. The sauce wasn’t creamy, but watery… Tim thinks it was supposed to be. Flavor was good, but that was weird. Then we watched Abraham Lincoln: Vampire Hunter, we had also seen it in the theatre. It was good.